Every day we ask influential politicos to send us their top three bullet points that are driving the day's conversation inside and outside Washington. – The Boehner bill will pass. The Balanced Budget Amendment sealed the deal with many House conservatives. Amazing what the GOP can get if conservatives fight. If only Boehner had fought harder initially. – The President held a morning press conference where he admitted, in effect, that he has no plan. Last night with Wolf Blitzer, White House Chief of Staff William Daley kind of sort of suggested the President had a plan. But it was a secret plan. – I can't help but get the sense the GOP came off looking bad and like cheap dates. They passed Paul Ryan's budget hiking the debt ceiling to $23 trillion. They passed Cut, Cap, and Balance, which got more votes than Boehner's plan will get. And now Boehner's plan. That's not a negotiation. That's an auction for affection. – The ‘WikiLeaks Phenomenon’ & the Disease of Secrecy Within the U.S. Govt. Editor’s Note: The blog is a place for a freewheeling exchange of ideas and opinions. CNN does not endorse anything said by its contributors. Joanne Lipman and David Wessel talk with CNN's John King about consumer confidence. Sen. Joe Manchin tells CNN's John King why he would vote "no" on both the Boehner and Reid deficit plans. CNN's John King asks Sen. Rand Paul why he thinks the Democrat and GOP deficit plans aren't worth his vote. – Product Failure: Democrats are quietly looking at poll numbers that in combination with redistricting plans indicate a takeover of congress is possible in 2012, is the Tea Party the Edsel of politics? – Marketing Failure: After hoping that Senator Marco Rubio would be key to saving the GOP from a demographic political abyss, frustrated top Republican consultants are realizing that Latino voters want candidates that not only look like them but that also think like them. – Just Plain Old Failure: President Obama's deficit cutting plan – $4 trillion, Reid's deficit cutting plan – $2 trillion, Boehner's deficit cutting plan – $850 billion, watching the GOP brand implode – priceless. – A week ago, all the House GOP and 5 Democrats voted to send the GOP's Cut, Cap, and Balance plan to the Senate where it came just a few votes shy of a majority. Today, the House GOP will send John Boehner's new scheme to the Senate without all the GOP votes, probably none of the Democrats' votes, and it will get no votes from the GOP in the Senate with a pledge to get no Senate Democratic votes either. Apparently that's leadership. – What will probably happen is the Senate Democrats will use John Boehner's plan as a shell to then insert their own plan, including the tax increases the President wants, and then send it back to the House daring the Senate GOP to filibuster it and the House to kill John Boehner's plan. – Meanwhile, at the other end of Pennsylvania Avenue, the President still has no budget, no debt ceiling plan, and his press secretary is increasingly losing credibility with the press. Ain't politics grand? According to data from the Pew Research Center, the electorate's partisan affiliations have changed since President Obama was elected in 2008. 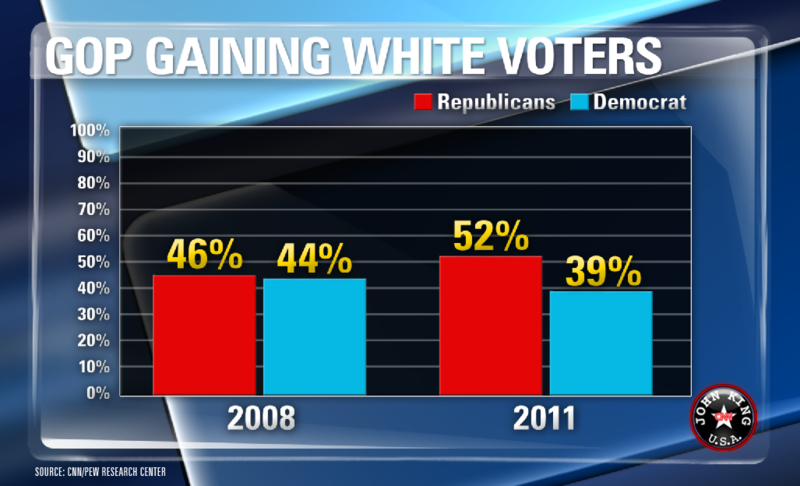 As this graph shows, GOP gains have occurred among white voters. CNN's John King asks Fareed Zakaria what the global consequences would be if a debt deal is not made in U.S. by August 2. – The Wall Street Journal is calling conservatives "hobbits." The Weekly Standard is calling them "pro-Obama conservatives." John Boehner is telling conservatives to get their rears in line to vote. Interestingly, a lot of conservatives say if Boehner took out his super committee he'd get more votes. – Now the Congressional Budget Office says Harry Reid's plan actually cuts more money in the next two years than John Boehner's plan. – If that's not bad enough, there is a growing sense on Wall Street that no matter what happens in Washington our credit rating is tanked. It might make you think Washington is broken, but remember that gridlock is a feature not a bug in our constitution. The bug is Washington expanding the commerce clause beyond its original meaning, without amending the constitution, to use it to spend on every program Washington politicians' hearts desire. CNN's Jessica Yellin talks to White House communications director Dan Pfeiffer about what is next in the debt debate. – The Boehner Plan is the real plan and Reid is a distraction. How do I know? They have the same title. They have similarly worded provisions throughout. But Boehner's plan in the House has procedurally been attached to a pre-existing Senate bill while Reid's plan has not. This means Boehner's plan can move faster than Reid's. – Sources close to S&P have told CNN's Erin Burnett that Boehner's plan might still cause a loss of credit rating. If Boehner's plan is the plan, look for the Democrats to use the credit rating issue against the GOP once it happens. – Conservatives aren't giving up without a fight. Club for Growth, Heritage Action, Let Freedom Ring, and many others are coming out in opposition to John Boehner's plan and they'll be led in the fight by Congressman Jim Jordan, John Boehner's colleague from Ohio. – Debt Ceiling Dysfunction: The partisan plans that were put forward yesterday have no obvious common ground to build on – they are the kind of proposals usually put forward at the beginning of a negotiation, not the end. And alleged purpose for this forced fire-drill – dealing with the deficit and debt – has been all but abandoned as cuts and commissions take the place of tax reform and entitlement reform. This will be seen as a wasted opportunity. – John Boehner's Problem: He can't seem to control his own caucus. His own bifurcated plan was rejected by Tea Party conservative groups moments after he unveiled it. And his response to the president's address last night was a dishonest and hack-ish speech, full of talking points stitched together. You can criticize the president's leadership, but saying that the current state of negotiations represents 'a blank check', a 'president who can't say yes' and a rejection of entitlement reform doesn't square with the facts on the ground. – Playing the Reagan Card: CNN played the full Reagan radio address on the debt ceiling that President Obama referenced in his address last night. Keep playing it. The arguments are the same, from a voice that Republicans might actually listen to. As congressional websites and switchboards get overloaded, this is a timely reminder of a forgotten principle – the good of our county always comes before the good of your party.